Affirm your own business and life strategies from the raw, personal and honest stories that are shared with you. Get just one spark of a creative idea and imagine how you can generate substantial change and grow your career and/or your business. Visit our social, business and video realm! This is an AMAZING automotive industry podcast! If you have never listened to one of the Remarkable Results Radio Podcasts - you are sorely missing out. The interviews are transparent and fair. He covers absolutely everything from management & operations to technical and legislative. ...And it's ALWAYS entertaining. Give this podcast a try - you will be so happy you did! And then check out the LIVE Friday afternoon Town Halls! Multiple viewpoints on so many different topics! Check it out and then leave your own review. I just wish I had left one sooner - I've been listening to the Remarkable Results broadcasts for years. Carm rocks! Time Well Spent. Actionable Value. This is one of the few auto podcasts I’ve come across that delivers niche, actionable value. Our industry is changing. If you aren’t preparing, if you aren’t enabling innovation, you are putting an expiration date on your business. Take some time during your commute to listen to this show. It will be time well spent. Very much enjoy this Podcast. So many great ideas shared in each episode whic help me in my business. Listening to the show Will colm your mind and make you money. I enjoy most of the shows always see to lear a lot. Carm is taking the lid off of the independent automotive aftermarket and shining lights where they haven’t been shown before. Each episode is filled with guests that share a amazing amount of insight so that others can learn from. With Carm’s style of interviewing and his “smooth jazz” voice, he’s able to get the true personality of his guest out onto the airwaves. Every episode is filled with gems that we can take back and use in our shops immediately. It’s like finding that surprise toy buried in that box of Cracker Jack’s. Every box there’s something different. Loving this podcast. Episode topics are interesting, the content is incredibly helpful, and the episode length is perfect. Keep up the great work, Carm. Carm is very insightful, he gets to the heart of the matter in very candid conversation. He also stays up to date on technology and social media trends. His industry specific interviews are right on point and very helpful. Every shop owner should tune in! Carm has a natural, easy interviewing style that makes these interviews fun and interesting to listen to. It's kind of like Car Talk, but instead of cars and issues, it really goes after aftermarket shop talk; getting to sit down with successful car shop owners and hear about how they manage their shop, techs, and stand out. Great work! Learn from your industry peers in a round-t able forum. Get new ideas, perspectives, trends, insights, best-practices and expertise from aftermarket professionals. Watch like a DOCUMENTARY … Learn like a SEMINAR. 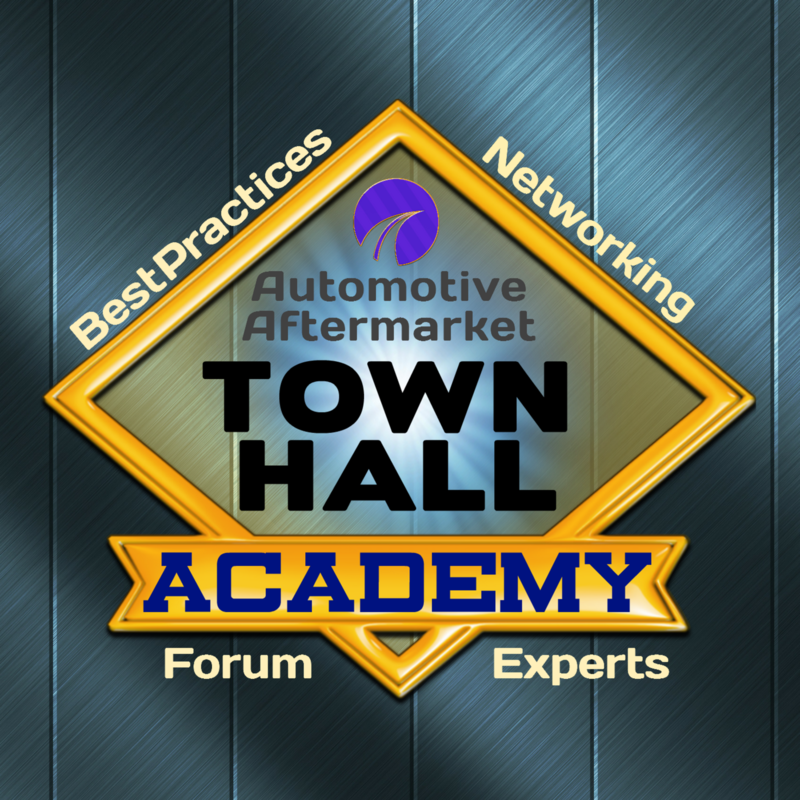 Helping automotive aftermarket professionals improve; one lesson at a time. We interviewed in episode 6 & 7. What I love about Gene is his commitment to the customer and in his interviews, you will learn a lot about Gene’s remarkable results and how he has worked hard to get where he is. He was also on a round-table on The Value of a Business Coach. Recently Gene has become a business development coach with Elite Worldwide. Ron Haugen owns Westside Auto Pros in Des Moines Iowa. Celebrating their 20th year in business in 2017 Ron has a staff of 25. Ron is an ASE Master Technician, has his AAM certification and is an AMI Certified instructor. Ron also provides coaching and consulting for auto shops across the country. Ron is Co-Chair of Vision, Hi-Tech Training and Expo, President of the Des Moines ASA chapter and wants to be in Puerto Morelos Mexico whenever he is not in Des Moines! You can hear Ron is episode 107 and on Town Hall Webinar on ‘The Great Qualities of a Service Writer‘ and the very powerful webinar on ‘Business Succession: Selling your business”. Ron was also on a Vision KC round table. Maylan Newton from ESI – Educational Seminars is a business coach, trainer and industry speaker. Maylan is no stranger to the podcast having paid it forward on two episodes … 108 and 140. Maylan is no stranger to the power of the customer as he speaks and trains on Professional Business Development, Service Writers School of America and In Shop Training and Support. He is an approved AMI Trainer. He is a much sought our speaker at industry events in the US and Maylan will speak at this year’s Automechanika among others. You need to know your customer profile. Have an avatar of your ‘perfect’ customer. When they walk in the door you’ll know ‘this person needs to be my customer’. If you have the perfect customer you will do everything to keep them. Social media is important to talk to your customer. Become top of mind awareness in the palm of their hand. You can build loyalty one transaction at a time. Older generations are more loyal than younger. Younger generations are not build that way. They will go to another shop and they do not see it as not being loyal. It may be convenience. Explain what your benefits are and be sure the customer understands the value they have received. Walk them out to the car, be sure it is clean and give a comprehensive explanation of what you did and what is next and what may happen next. What we want is not what they want. Keep an open mind. Gene Morrill uses a mailed newsletter to his customers. Includes call to actions with puzzles. Keep important notes on every customer so you can keep a fluent dialogue and maintain a close connection to them. Keep your name out there. Chinese auction donations. Banner for the little league park. Make it local. People need you less often because cars are built better so you need to find ways to reach out to them through other means. Go to the little league games of teams you sponsored. Have a marketing plan, calendar and budget as a percent of your sales. List everything you do for marketing. Be specific. Put a dollar amount next to the initiative. Your customers personal experience goes a long way for retention. Retention starts when the phone rings. Be what you want your customers want you to be. 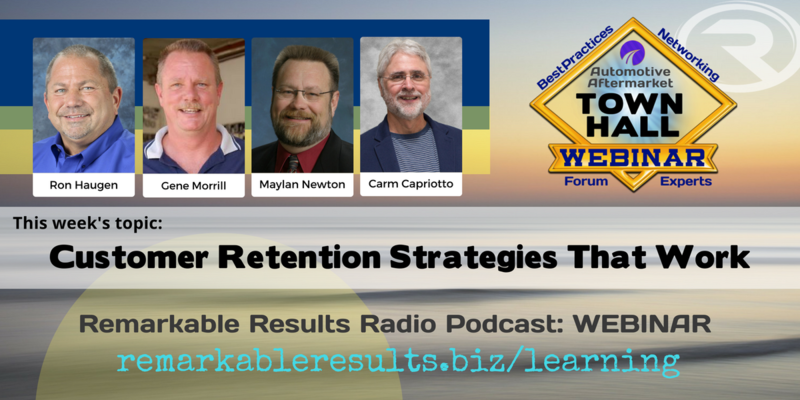 Carm is the founder and host of the Remarkable Results Radio Podcast; the only one of its type in the automotive aftermarket. Carm calls on his 35 years’ experience in the aftermarket to bring engaging stories from his guests. Listen to raw, unfiltered, honest, and sincere stories that include insights, trends, best practices and expertise. Each interview brings an opportunity to learn one new thing through the stories of personal achievement. Many podcast guests tell their story of transformation from working in their business to working on it. As host, Carm uses his enthusiasm and passion for the aftermarket especially the service sector to take his listeners on a journey showcasing successful service professionals’ path to Remarkable Results. He also enjoys interviews with aftermarket industry thought leaders who bring their industry perspectives to his listener.